RVnGO is America's best marketplace to find RVs to rent in Montana. Find your RVnGO! Appreciate a nice drive in your RV rental in Montana to Missoula and have a blast at the Montana Snowbowl. From novice green runs to expert black diamonds, everyone will enjoy the flawless powder like the snow of this mountain paradise. Camp in close-by Missoula and make a beeline for the slopes, where you can rent gear, eat at the delicious restaurants, and take a lift up to the summits for a day of winter fun. Summer guests are invited to hike, zip line, play disc golf (Folf) and mountain bike, making this a beloved a year-round attraction. Steer your RV rental in Montana to Billings and spend an evening at the Yellowstone Valley Brewing Company. One of Billing's most famous attractions, the Yellowstone Valley Brewing Company is a microbrewery which makes the best specialty lager in Billings. You can test its blends, eat some food, play a few games, and tune in to live musical performances. It is an excellent place to chill and meet a few local people. The "Carport" is open from Monday through Saturday, 4:30 pm to 8:30 pm. If you are a history fan, drive your RV rental in Montana to Great Falls to visit the Lewis and Clark National Historic Trail Interpretive Center. It is a place where you can learn more about their 8,000-mile journey across North America, which was critical to the expansion of the United States. Begin your voyage by watching one of two introductory movies in its 158-seat theater, afterward check out at the displays loaded with ancient treasure and memorabilia of the trek, which is surrounded by a two-story diorama of the portage of Missouri River's five great falls. Additionally, you can simply enjoy the nature trails outside the center. Minutes from the downtown region of Helena, the Lincoln Road RV Park is â€œIn the Heart of Montana. It has 56 accessible spots, 44 of which are full hookup spots with tables, porches, and space for slideouts. It can contain a wide range of RVs including Class B and Class A rentals. Services and amenities include wi-fi web access, recreational hall, nature trails, restrooms and showers, and laundry rooms. Enjoy connecting with nature at the Lincoln Road RV Park in your camper rental in Montana! Sunrise Campground is a spectacular destination if you are heading your RV rental in Montana to Bozeman. It is the nearest RV Park to the downtown area and only a couple of minutes to the Yellowstone National Park. It has 50 accessible full hookup spots with space for slideouts. Services and conveniences include wi-fi web access, recreational halls, play area, restrooms and showers, laundry room, and self-serve RV wash. Stop season is from April 1 to October 30 for your RV rental Montana! Held each August in Bozeman, the Sunrise Campground is a three-day event committed to promoting and cultivating the arts. With activities for the whole family, the 40-year-old festival includes music, theater, dance, more than 100 arts, and craft vendors, a flower show, chalk on the side-walk, workshops, beer and wine garden, the nibble of Bozeman, an adult and children's run, as well as a parade. Take a ride in your Montana RV rental and visit the city of Lewistown in mid-August to appreciate the community of ranchers at the Montana Cowboy Poetry Gathering and Western Music Rendezvous Nearly 25 years ago the event was formed and is dedicated to celebrating and preserving the history, heritage, and values of the cowboy lifestyle in the Upper Rocky Mountains West. With more than 120 cowboy poets, western musicians and artists sharing their talents, it also includes a Western Art and Gear Show, a Jam 'n Dance night, and loads of cowpoke food and drinks to enjoy! 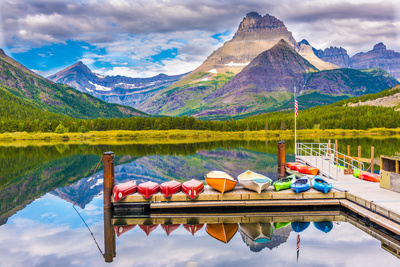 The state of Montana isn't all about cowboys; it also has many scenic landscapes, fun attractions, and memorable monuments to explore. Lease a RV to Montana at RVnGO and make the most of its wonderful views and incredible history!